Are you ready for some fun???? 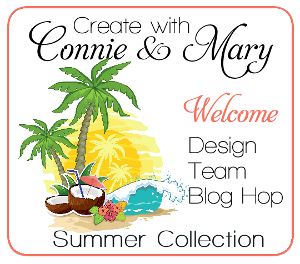 Instead of our regular post for the Create with Connie and Mary Thursday Challenge, since this is Preview Week for our Summer Collection…we are having a BLOG HOP!! If you are going forward through the hop you arrived here from my friend and Create with Connie and Mary partner….Connie Babbert and her Inkspired Treasures blog! Don’t you just LOVE her style? I do! OH MY WORD I just LOVE our color challenge this week. 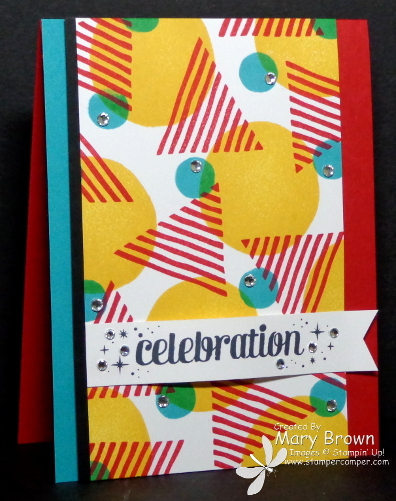 Real Red, Crushed Curry and Bermuda Bay are just SOOOO happy that I HAD to make a very HAPPY card! If you remember on Monday was my Preview Project and I used the What’s Your Type? set for it. Since I used the set for the challenge, I decided to use it for my card! Wouldn’t this just brighten your day if you received it? Yep…me too! We’re are getting close to the end or our Preview Week for our Summer Collection 2014! This collection features products from the NEW CATALOG…you don’t want to miss it! Now’s the time to join and save $5 with our Early Bird Special…but hurry…it ends SATURDAY!!! 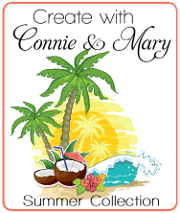 More details on Create with Connie and Mary! This entry was posted in Create with Connie and Mary and tagged Project Life Remember This, What's Your Type. Bookmark the permalink. A very happy looking card! I don’t know why but this stamp set had to be one of the first one I bought! I love what you have done with it here. Happy indeed! Love the geometrics and the 2 different colored borders. Super cute card, Mary. Wow! This is awesome! What a fun way to use this set! Love it! Oh, this is lots of fun! Glad I got this stamp set! I didn’t care for this stamp set because of the way it was displayed in the catalog, your version is so much better! Your card is fantastic Mary! I love the geometric design with the sentiment, very festive! This card would Absolutely brighten someone’s day… it’s so bright and happy!! It’s a celebration all by itself!! Like Debbie, I wasn’t drawn to this set but I love what you’ve done with it! Love this card Mary – i agree this set is a ‘must have’ and I love how you used it to create a bold fun graphic design with this week’s fab colours!